The best potato-frying technique we tried was this one, by the famous French chef Joël Robuchon. 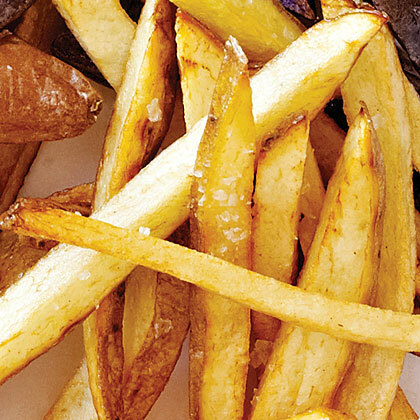 The low-heat method takes a little time, but will give you very crunchy fries. Spread cut potatoes in bottom of a large roasting pan in a single layer. Add enough oil to cover. Put on a stovetop, preferably over 2 burners, and cook over low heat, moving pan as necessary to prevent hot spots, until tubers are tender when pierced, about 25 minutes. Using a spatula, carefully lift potatoes every so often to keep them from sticking. Increase heat to medium-low (no higher) and cook potatoes, stirring every 10 minutes, until golden and crisp, about 30 minutes more. Drain on paper towels. Sprinkle immediately with salt.